Leading bathroom retailer C.P. 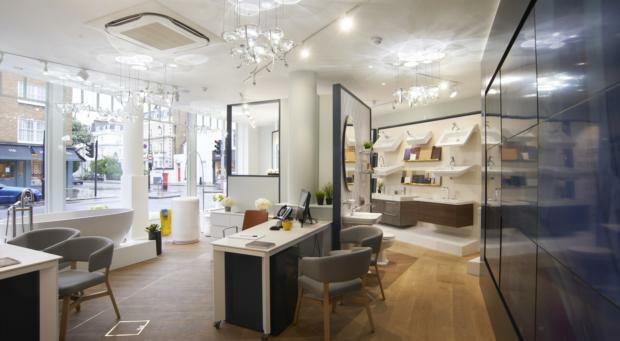 Hart opened the doors to its ninth London showroom during the London Design Festival last month with the launch of C.P. Hart Chelsea, an inspirational new retail concept for the bathroom industry featuring a lighting sculpture by Jason Bruges. C.P. Hart adopted an entirely new design approach for the showroom. ‘i-am’ were appointed to develop the customer experience and work with C.P. Hart’s in-house design team to create a space that would inspire not only the Chelsea design community, but also retail customers through layout, product selection and technology. Demonstrating how physical and digital retail are becoming increasingly merged, ‘i-am’ and C.P. Hart have created an environment that showcases the key collections and pieces from C.P. Hart’s extensive product range, augmented by integrated digital interfaces as a seamless, limitless ‘virtual showroom’ extension of the finite physical space. An ultra-large format media wall attracts and inspires with digital art inspired by water and movement, and will present customers with a virtual ‘walk-in’ customised visualisation of their new bathrooms. The consultation hub in the lower ground floor gallery features an interactive screen that enables architects, designers and consumers to work with C.P. Hart designers to explore the full range of product options, create digital mood boards and visualise the bathroom design process. C.P. Hart’s key brand value of ‘inspiration’ was conceptually translated by ‘i-am’ into the idea of a dramatic statement art-piece that would express and celebrate the flow and beauty of water. To interpret and develop this, ‘i-am’ & C.P. Hart commissioned Jason Bruges Design to create a unique and dramatic sculpture for the space. Clear, water-filled glass hemispheres hang from the ceiling and are used as lenses to create forever changing lighting patterns using computer-controlled LEDs and fans.